Do I need any more shoes? Well, no. I am half-shuddering in anticipation of what the reaction will be when the parents visit for graduation next week and peek inside my closet to see um, three or four dozen pairs of shoes. Suddenly, their questions as to where all those student loans went will be answered. But. 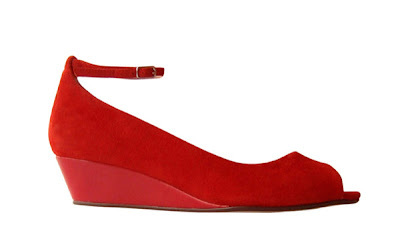 Are these not the loveliest wedges ever made? Truly, they are. I may already own three pairs of ankle-strap peep-toes, but those are flats, and that's a completely different thing. Damn it, Marais, I do not have the funds to keep falling in love, and yet you keep seducing me.